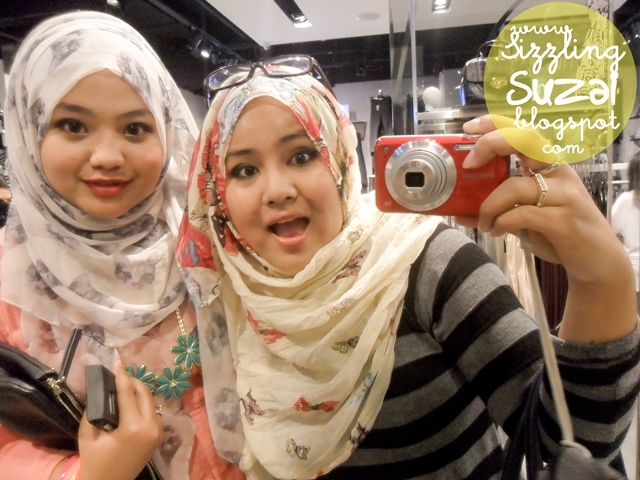 Venue: Topshop of Mid Valley Megamall, Kuala Lumpur. First of all, dear SyafiqahHashim thanks a lot for that belated gift yar. ;) hehe..well, the most is tqsm for forcing me to eventually join the party. Oh, scarf and rings are definitely my fav items, love it! Btw, the 'Personal Shopper' is a service where a stylist gonna ask you some related questioners inclusive your shopping budgetary. then, he will line up the clothing that might suits your interest. so, you just need to visit the shop at the promising date&time, try all the selected clothes, make your choice and pay without wasting time pondering on whats best for you. yup, he gonna be your personal image consultant! Oh, you need to set an appointment beforehand whether tru the phone call nor email him (the guy wearing WHITE shirt!). as informed, only the Mid Valley's franchise is giving out this service yar..
credit photos to SyafiqahHashim, my crime partner of the sleepy morning! haha..